Evolution Plaster & Wipe Dispensers include 100 assorted plasters and 50 moist wipes and is ideal for treating minor cuts. The kits are supplied in a reusable Evolution case to keep them fresh and ready to use and can be mounted on the wall with the bracket for a better storage, access and increased visibility. While on the bracket, the kit can be opened without any of the items inside falling and can be used as a self-supporting workbench to ease providing first aid help. All the plasters are individually packed and sterile and have a breathable material to eliminate skin damage. The different shapes included in the kit are ideal for treating a wide variety of injuries. The wipes are used to keep the area clean and sterile in order to avoid wound infection. These Evolution Plaster & Wipe Dispensers are highly recommended for dealing with minor cuts. The Evolution Fabric Plasters are made of a comfortable stretch fabric that conforms easily to body parts and allows maximum flexibility. The Evolution Washproof Plaster & Wipe Dispenser Kit includes individually wrapped and sterile plasters that are washproof and high quality hypoallergenic. 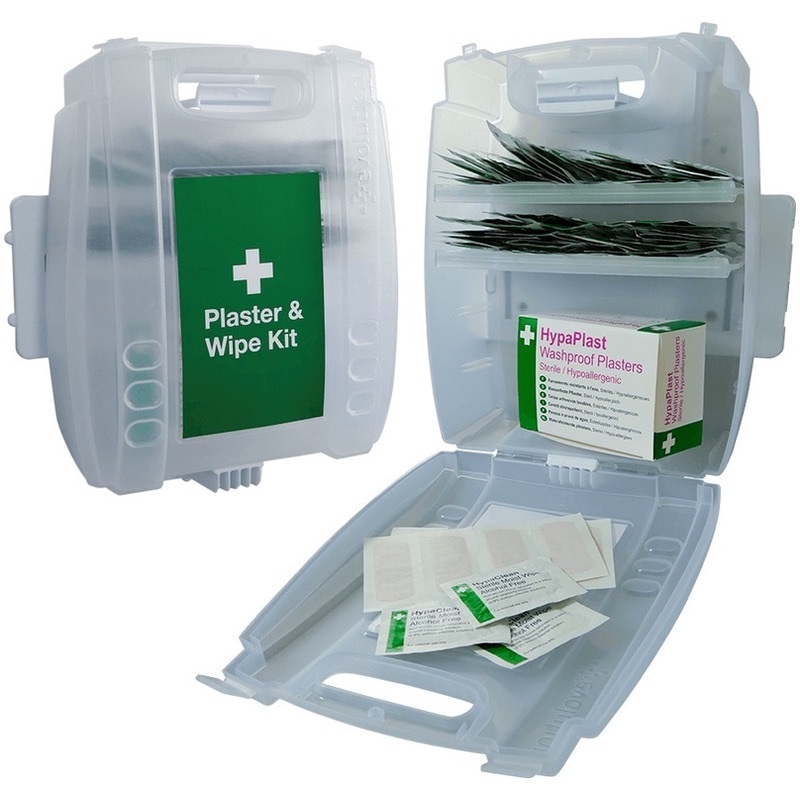 The Evolution Blue Detectable Plaster & Wipe Dispenser is a must have for catering environments where plasters are one of the most used first aid items. The Dispenser provides you the "blue items" required by the food hygiene legislation. The blue catering plasters are metal detectable and washproof, essential for catering and food handling applications. The Evolution Blue Detectable Plaster & Wipe Dispenser is highly recommended for treating minor cuts in food handling environments.